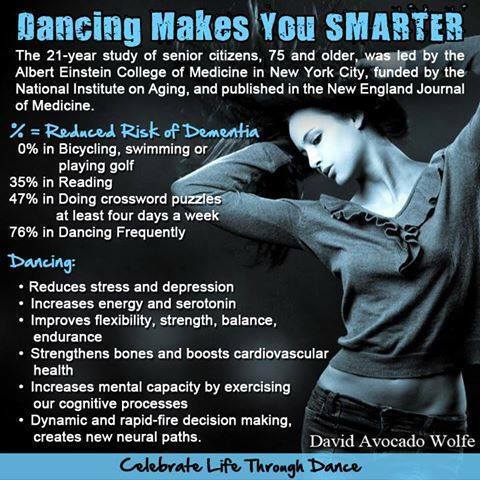 I have retired from teaching dancing to spend more time on my writing. If you are interested in lessons in these areas please check with all the venue's I taught at for a replacement teacher. The following is an excerpt from the Bloor West Villager newspaper on InsideToronto.com. Lisa Rainford has interviewed my mother many times over the years and I was very happy she was interested in doing the last one. 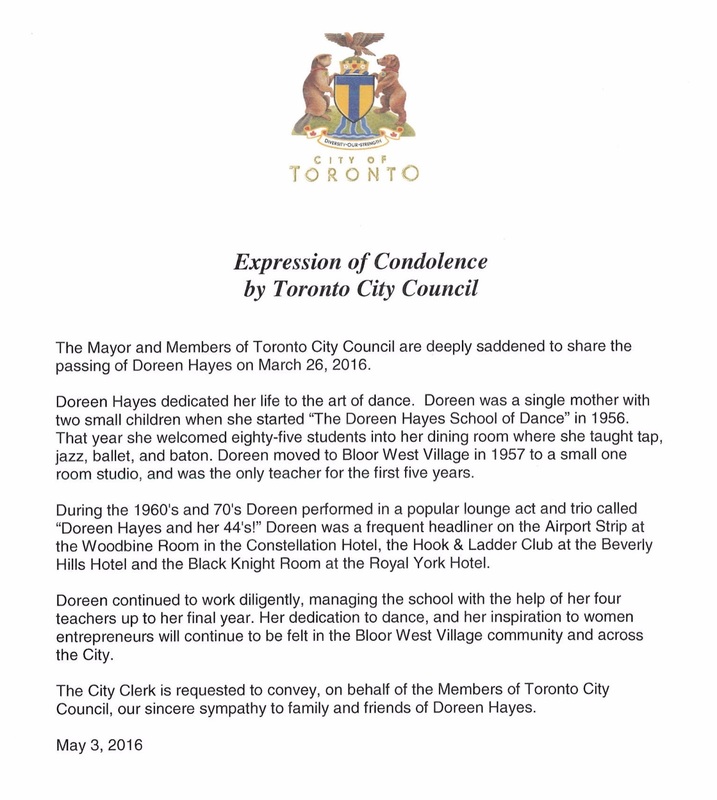 Doreen Hayes, the owner of the Doreen Hayes School of Dancing in Bloor West Village, passed away in March at the age of 83. On June 24, students of her school will perform in the last ever end of season recital as the school is officially closing. Doreen Hayes was a determined woman to say the least. 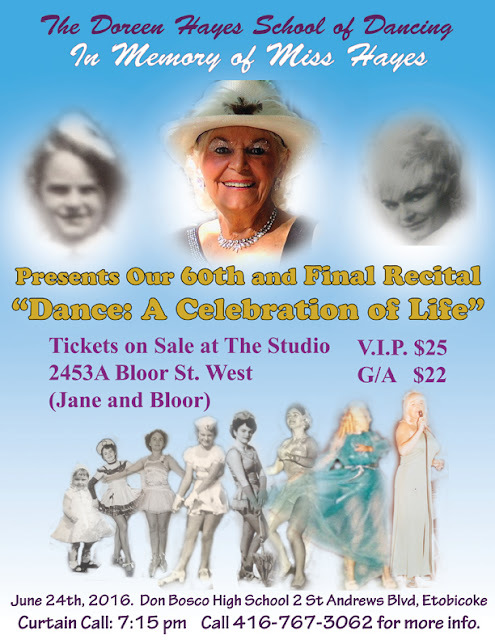 The dancer and proprietor of the Doreen Hayes School of Dancing, a fixture at the corner of Bloor West and Janes streets since 1956, had finally decided to retire – begrudgingly – at the end of the 60th season in June. However, Hayes died of heart failure March 26 at Humber River Regional Hospital, surrounded by her family and loved ones. 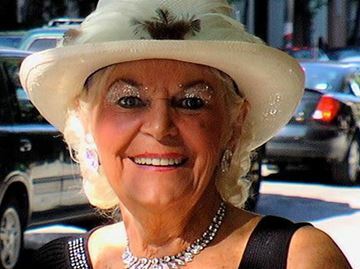 She would have been 84 in July. “‘Closing that door on the studio would kill me,’” Hayes’ eldest daughter Alannah Ryane recalled her mother once saying. 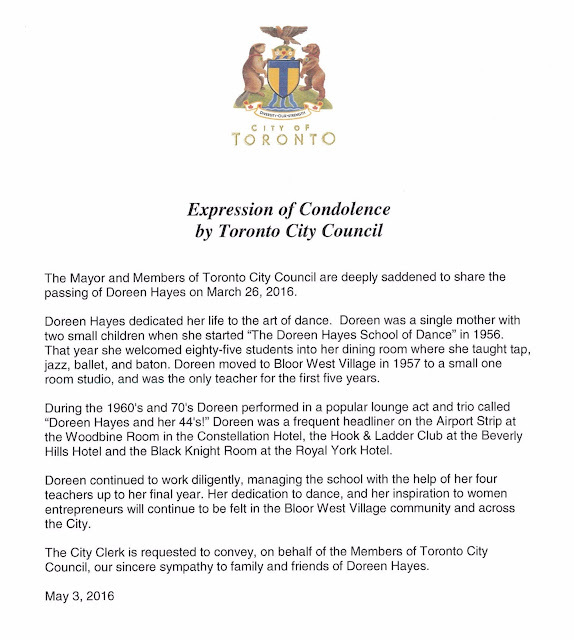 And so, it was fitting the owner of the longest running, privately owned dance studio in Ontario died before that day arrived, Ryane said. “When she did go, she went peacefully,” she said. 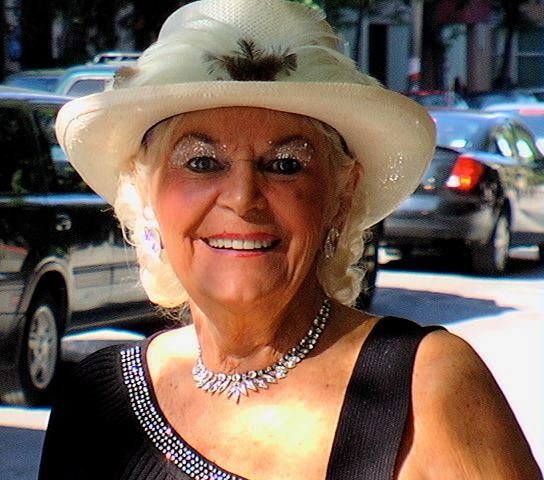 At her mother’s April 6 funeral and celebration of life, which included an ‘after party,’ Ryane said she made sure everyone received a piece of Hayes’ 80 pounds of costume jewelry. “I gave them feathered boas. We had a three-piece jazz band. She would have loved it,” Ryane said. Even though she hadn’t been to her school for quite some time because she couldn’t manage the steep set of stairs, Hayes took a trip to Casino Niagara only two weeks before her death. 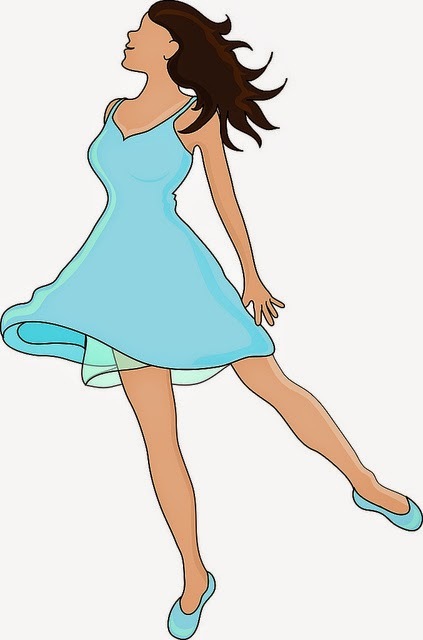 “Nothing was going to shake her,” Ryane said with a laugh. Despite its leader’s death, the school’s end of season show goes on. 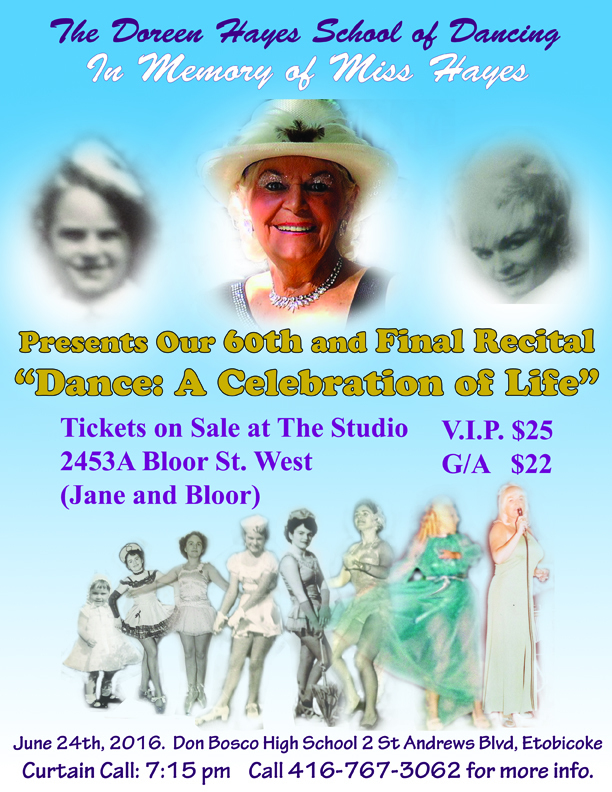 The 60th and final recital, in memory of Hayes, is called ‘Dance: A Celebration of Life’ and will take place Friday, June 24 at Don Bosco Catholic Secondary School. Lisa Rainford is a reporter with the Bloor West Villager. She can be reached atlrainford@insidetoronto.com. Follow the Villager on Twitter and Facebook.